Summary: The share of women working today is near an all-time high. While their earnings and projected retirement incomes have grown compared to previous generations of women, a significant gender gap still exists. At the same time, women continue to bear most of the responsibility of caregiving, and many have to juggle the demands of work and taking care of a child or adult loved one. To compound this struggle, more women are handling these duties on their own, as more are either never married or divorced. These challenges put a strain on women’s ability to work and earn a decent living, making it difficult to achieve economic security in old age. 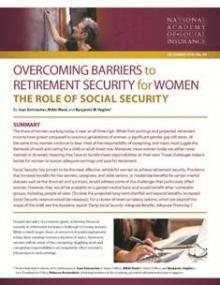 Social Security has proven to be the most effective vehicle for the achievement of retirement security for most women. Enhancing Social Security benefits would be an effective strategy for improving women’s retirement security—especially for women 75 or older, who face a significantly greater risk of poverty than their male counterparts. Expanding benefits would require increasing system revenue beyond what is necessary to close the projected long-term shortfall. Provisions that increase benefits for low earners, caregivers, or older seniors, or modernize benefits for certain marital statuses such as the divorced and survivors, would address the challenges that women particularly face. But they would be available on a gender-neutral basis and would benefit other economically vulnerable groups, including people of color and people with disabilities.